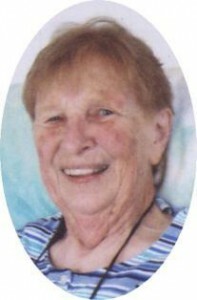 Mary E. Nash, 79, of Crandon and Port Washington, WI and Key Largo, FL died Monday, June 27, 2011 at Horizon Hospice of Columbia St. Mary’s Hospital-Ozaukee Campus in Mequon, WI where she had been the past few days. She was born on August 26, 1931 in Port Washington to C. Donald and Agnes Bay Hill. She grew up and graduated from Port Washington High School. On June 20, 1952 she married Marvin Nash of Port Washington in Crown Point, IN. They raised their family on Crocker Street in Port Washington. For the last thirty years or so, she and her husband wintered in Florida and spent their summers in Northern Wisconsin. Marvin preceded her in death on April 7, 1999. She remained independent; enjoying the seasons, sharing with family and friends. She enjoyed her grandchildren, crossword puzzles, NASCAR and especially the Green Bay Packers. Never a more true, proud fan could there be. She is survived by her children Jeff (Dawn) Nash of the Town of Grafton, Julie Nash of Port Washington and Jody (Scott) Gregorash of Port Washington, four grandchildren Robert and Michael Nash and Kyle and Abbey Gregorash, two sisters Betty (Ron) Schowalter of Port Washington and Carol (Dan) Priske of Green Lake, WI; nieces, nephews, other relatives and friends. Family services have been held. Memorials to Forest County Humane Society, PO Box 57, 701 Industrial Pkwy, Crandon, WI 54520 or Ground Hemlock Lake Assoc. c/o Shelle Feagles 6148 Hilldale Drive, Hartford, WI 53027 or charity of choice appreciated.